What probes did the United States send to Venus in the 1960s and 1970s? 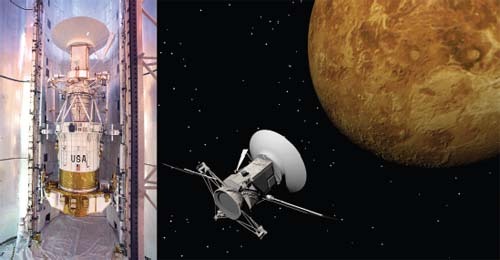 The first U.S. spacecraft to reach Venus successfully was Mariner 2, which flew by Venus in 1962. Another flyby was achieved by Mariner 10 in 1974; as the spacecraft headed toward Mercury, it took many close-up pictures. In 1978, the United States launched two more spacecraft to explore Venus. The first, called Pioneer-Venus Orbiter (PVO), was launched on May 20, 1978. It studied the planet’s atmosphere and mapped about 90 percent of the Venusian surface. It also made observations of several comets that passed near Venus, and provided information on mysterious gamma-ray bursts. PVO ran out of fuel in October 1992, and it descended into the Venusian atmosphere and burned up. The Pioneer-Venus Multiprobe (PVM) was launched on August 8, 1978, and distributed four probes around the planet, which then traveled down through the atmosphere and onto the surface of Venus. They measured atmospheric temperature, pressure, density, and chemical composition at various altitudes. One of the four probes survived after impact; it transmitted data from the surface for sixty-seven minutes. MulThe Magellan (left) is attached to a booster rocket before its launch in 1989. (NASA). An artist’s concept (right) of the Magellan near Venus.